For Fran that list would include her husband, Max, her daughter, and her best friend, Alison. Only Alison is now desperately ill and she needs Fran's help. She wants to find her husband a new wife, and leave her young daughter with a new mother. Fran finds the whole idea deeply uncomfortable, but it's hard to refuse your closest friend at the best of times, let alone ignore her dying wishes. So Fran reluctantly logs on to an internet dating site, where she stumbles across a startlingly familiar profile. 'Footloose' describes himself as divorced, but his photo looks exactly like Fran's husband, Max. What's a wife to do when she suspects her husband's cheating and can't bear to confront him outright? Posing as 'Sassy', Fran sends a reply to 'Footloose' and sets out to date her own husband... But this increasingly crazy plan leads Max to start to have doubts of his own. 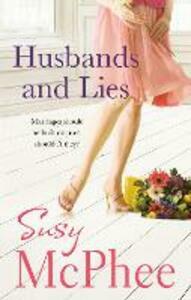 Torn between suspicion and love, life for Fran just got very complicated - can her marriage survive?